Coffee Hair Masks. Coffee can be used in various masks and hair packs that help to boost the hair growth and bring in shine and robustness to hair. Coffee softens and adds shine to the hair. This olive oil and coffee hair mask helps in nourishing and hydrating the scalp and roots. Apply the paste on the roots as well as scalp and massage gently for 10-15 minutes. Let the mask sit on for another 40-45 minutes and thereafter wash off with cold water and a mild shampoo. Yogurt is known to be a natural conditioner and it helps in smoothening the hair strands as well. Coupled with coffee for hair, yogurt makes the hair soft and silky. Wash off with lukewarm water and a mild shampoo and repeat the process weekly for best results. Honey and coffee are the best combination for hair revitalization and healthy growth. Honey provides the best moisture and hydration to the scalp and also cleans it off bacterial and fungal infections. Coffee helps in naturally coloring the hair strands as well. Apply the paste all over the scalp as well as strands and leave it on for 15-20 minutes. Wash off with normal water and a mild shampoo for best results. Eggs work as natural conditioner for hair, treating dull and brittle hair and restoring the damage. It also treats the oily scalp and problems associated with it. Loaded with vitamins, iron and sodium it has abundant of nutrients that are necessary for hair growth. Lectin helps in restoring the damaged hair caused by frequent dyes and colors. In a bowl combine together one tablespoon coffee powder along with one egg yolk to make a paste. Apply the paste on the hair, especially on the scalp and rub for at least five minutes. Thereafter, let it sit for another hour and then wash off with cold water and a mild shampoo. Repeat the process at least once a month for best results. Coconut oil is one of the best ingredients for hair. Not only it works as a disinfectant, but also helps in hair growth. Along with coffee, for hair coconut blends in the scalp nourishing it and removing the sebum build-in from the follicles. In a bowl combine together one tablespoon coffee powder along with one teaspoon Coconut Hair Oil to make a paste. Apply the paste on the hair as well as scalp and leave it overnight. Wash off with mild shampoo and cold water the next day and repeat the process weekly for best results. So if you are wondering on how to color hair naturally with coffee, this coffee hair dye is the answer. Not only is it easy to prepare, but is a sure shot natural and organic alternative to chemical-laden hair colors. In a bowl combine together one tablespoon coffee powder and few drops of lemon juice to make a paste. Wash off with cold water and a mild shampoo and repeat the process monthly. Coffee works as a natural exfoliator that helps clean the scalp. Along with sugar it regulates blood circulation and stimulates follicles to kick-start the hair growth. 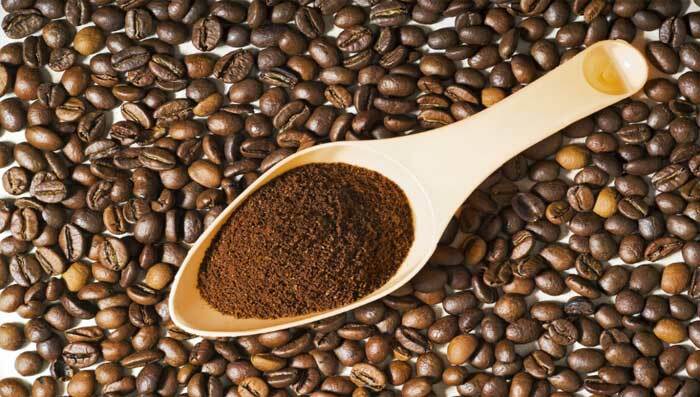 In a mixer, grind one tablespoon coffee beans and add granulated sugar to it. Wet the hair and gently scrub on the scalp for at least 10-15 minutes. Leave it on for another 30 minutes and wash off with cold water and a mild shampoo thereafter. Mayonnaise adds shine to the hair and maintains hair texture for a long time. Along with coffee for hair, mayonnaise strengthens the roots and even treats split ends. In a bowl combine together one tablespoon instant coffee powder with the same amount of mayonnaise and one teaspoon glycerine. Apply the mask on wet hair, starting with the roots and covering the strands. Let it sit for 40-45 minutes and wash off with a mild shampoo thereafter. Both garlic and coffee are one of the best hair ingredients that aid a healthy growth of the strands. Garlic is anti-inflammatory and a natural antioxidant and improves blood circulation on the scalp. In a bowl crush three to four pods of garlic and mix a tablespoon of coffee powder and a teaspoon of amla hair oil in it to make a paste. Wet the hair and apply the paste along the roots and scalp, gently massaging for at least 10-15 minutes and let it sit for another 30-40 minutes. Wash off with cold water and a mild shampoo and repeat the process weekly for best results.